Lung cancer is the commonest form of malignancy world over and is the most common cause of death. The disease is fatal if not treated early. Although, tremendous advances have taken place, the 5-year survival rate is still around 15%. Tobacco smoking is the most common cause of lung cancer and detection at the early stage is the key to successful treatment and prolonged survival. It is a malignant condition of the lung and the tumor usually arises from the bronchi although this can originate from the alveoli (bronchoalveolar cell carcinoma). Bronchogenic carcinoma is of 4 major sub types: squamous cell carcinoma, adenocarcinoma, large cell carcinoma and small cell carcinoma. The first three are known as non small cell lung cancer. 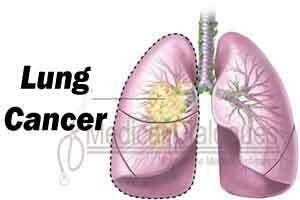 Lung cancer is the commonest form of malignancy in our country. It has surpassed the oropharyngeal carcinoma which used to be the commonest form. ICMR cancer registry, hospital based as well as community based, reveal it to be the commonest form of cancer in males and is amongst the top ten cancers in females. There is an increase in the incidence of lung cancer in recent years. The cancer atlas program also shows that the north eastern region of the country has the highest prevalence/incidence. It is estimated that every year nearly 58,000 new cases of lung cancer are diagnosed in the country. Tobacco smoking cessation is the most important preventive measure. People working in high risk occupations with exposure to asbestos, arsenic, pollution, mercury, lead, and other heavy metals and chemicals need to have regular chest X-ray done. Cough, expectoration, chest pain, haemoptysis, breathlessness, weight loss, anorexia, weakness, hoarseness of voice, dysphagia, superior vena cava (SVC) obstruction etc. Clubbing, findings of collapse, mass lesion, haemorrhagic pleural effusion, hard lymph nodes and SVC obstruction are some of the common clinical findings. Chest radiograph: A chest radiograph is the cornerstone to establish the diagnosis of lung cancer which may reveal findings like mass, collapse, pleural effusion, or mediastinal lymph nodes. There may be consolidation particularly non-resolving. Bronchoalveolar cell carcinoma will have an alveolar pattern on chest radiograph. Usually no treatment is possible at this level. The diagnosis need to be established first by other means as discussed below. However, the patients should be treated symptomatically with cough suppressants, pain relieving agents etc. Once the diagnosis and follow-up plan is made by a tertiary care hospital, the patient can be looked after for palliative therapy like pain management, thoracocentesis, cough suppressants and oxygen therapy etc. 2. It is important that the doctor at this level should be able to suspect a diagnosis of lung cancer from the chest X-ray. It is common for these patients to be misdiagnosed as having tuberculosis and continue receiving anti-TB treatment and important time is lost before a diagnosis is achieved. Even if this is missed, a patient of tuberculosis should respond to ATT within a period of 2 to 3 weeks, failing which the patient should be referred. It is important to get a histological diagnosis and staging of the disease. The performance status (ECOG and Karnofsky scale) is to be ascertained. The overall financial conditions of the patient are to be accessed. Radiotherapy is usually a localized form of therapy and can be given in localized disease as a specific therapy. Both chemotherapy and radiotherapy can be given as an adjuvant therapy to surgery or as neo adjuvant setting to downstage the disease so that the patient is operable. Recently targeted therapy (molecular therapy) is available in certain types of lung cancers. Palliative or supportive therapy like pleurodesis in massive and repeated effusions, care of nutrition, pain alleviation, management of chemotherapy related toxicities like nausea and vomiting, diarrhea or constipation, hair loss etc. One also needs to look after the terminal care of the patient. A cisplatin based 2-drug combination therapy is recommended. cisplastin and irinotecan is a good and cheap combination therapy and can be used in our country. Pemetrexed is a new anti-folate anti-metabolite useful in adenocarcinoma of the lung. It is to be given in combination with cisplatin. The above combinations is for non small cell lung cancer. For small cell lung cancer one can use cisplatin and irinotecan or etoposide. Molecular therapy: epidermal growth factor receptor (EGFR) inhibitors like gefitinib and erlotinib are useful drugs for treating adenocarcinoma of the lung particularly in non-smoking and Southeast Asian female patients. Cetuximab is a monoclonal antibody also useful in these patients. Vascular endothelial growth factor receptor (VEGFR) inhibitors like bevacizumab are a new drug useful for non squamous cell type of non small cell lung cancer. One should keep in mind that chemotherapeutic drugs are toxic and costly also. All the aspects should be explained to the patient as well as to the family before such a decision is taken. Usually the chest physician makes the diagnosis and the management should include a team of thoracic surgeon, medical oncologist and radiotherapist. However, a chest physician or an internist can handle such a case in delivering chemotherapy with proper training. Implementation of orders, monitoring of patients and counseling, management of side-effects.